For many people, keeping their vehicle organized can become quite a daunting task. It doesn’t take long for things to get disorderly if one doesn’t ensure that there is a place for everything in their vehicle. And, when you throw children into the mix things can get out of hand very, very quickly. Ask any parent and they’ll tell you how fast clutter, toys, stuffed animals, craft supplies and anything in between can accumulate when you have a child. Without a proper organization system in place, your child’s items can start to pile up and take over the house or vehicle. When your child’s toys are dispersed throughout the house it’s a lot harder to tell just how much there truly is. But when its confined to a small space, like the backseat of a vehicle, clutter can quickly overtake the space and make it unmanageable. Thankfully, there are plenty of backseat organizers available on the market to help cut back on some of the mess and chaos. We have taken a look at a number of car organizers on the market today and have been able to compile a top ten list of the best options available. We have taken into account many different factors, such as size, attachment style and design options to provide you with this top ten list. This foldable backseat organizer came in our number one spot on our top ten list for many different reasons. It is different in style than most options on our list in that in sits midseat in your vehicle instead of over the back of one of the front seats. This makes it easily accessible to both back and front seat passengers, an attractive option for parents and children alike. Other options on our top ten list fasten to the back of the passenger seat. This organizer sits mid-seat and features ergonomic handles, making it a breeze to tote around. This convenient feature is perfect for the parent who prefers to bring in the organizer after every trip to refill, clean or re-organize it. This storage device has eight different compartments – two big main sections, one pocket with a zipper, extra pockets found on the outside of the organizer and then four built-in cup holders. Though this backseat organizer is the one of the most pricey options on our top ten list, it is still affordably priced and more than worth the small investment. To add to its worth, the company offers a Lifetime Money Back Guarantee, which says a lot about how much they stand by their products. This all-purpose tote is a great addition to your vehicle organization system with features like deep pockets, a handy insulated wet wiper holder to ensure you there’s always something to clean up accidents, mesh pockets and even a pouch to hold your headphones. This organizer features a convenient pocket in it that will hold a tablet up to 12 inches in size. 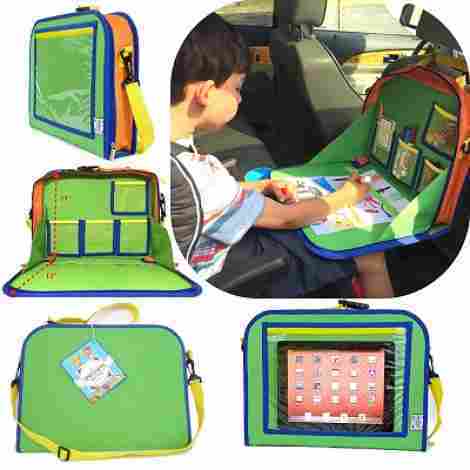 This is a perfect way for parents to set up their little ones with a television show or movie without worrying about the tablet getting dropped or broken in the backseat. 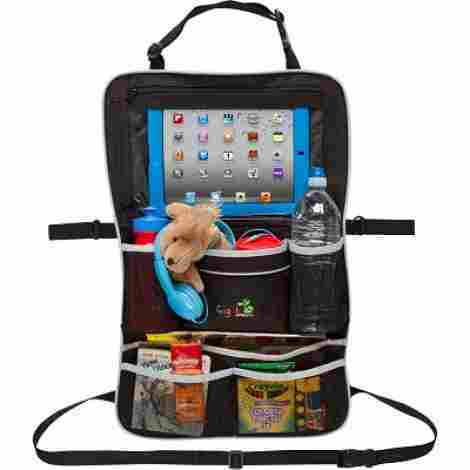 This organizer is made from heavy duty nylon, made to withstand the roughest and messiest kids. It is both water and tear resistant, likely to hold up quite well against even the most destructive children. 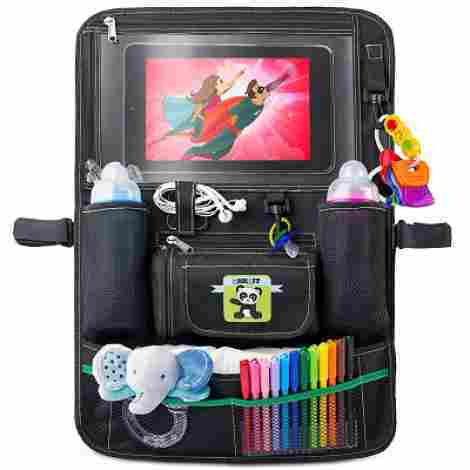 Moderately priced, this backseat organizer is worth the investment for parents who love to let their little ones enjoy a television show or two during long car rides. This product plays an important part in protecting your expensive tablets from rough hands. This organizer came in third place on our top ten list and won the ‘best value’ award from our editors because, not only is it the most affordable option on our list, but it’s highly functional and attractive as well. This storage device comes with a handy clear and touch-screen friendly viewing window. Simply slide your tablet up to 10.” Inches into the special pocket and let your kids watch their favorite shows or movies without worrying about them destroying your tablet. The pocket allows easy access to your tablets ports so keeping your electronics charged is a breeze. 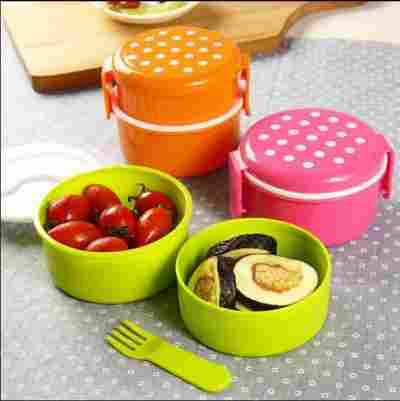 This organizer is made from 600D polyester which will prevent stretching and promote extra durability. This type of material features a waterproof backing which will help to ensure the back of your vehicle’s seat stays dry in the event of a spillage. As previously mentioned, this organizer won the Best Value award from our editors because it is the most affordable option on our top ten list. Couple its low price with the fantastic storage options it provides, this organizer can’t be beat! If you’re looking for a car organizer with plenty of storage space and pockets, look no further than this option. It’s fitted with a number of pockets and compartments and even has a zippered pocket to hold tablets up to 10.1” in size. This organizer features eight different pockets, some mesh and some zippered, to hold all of your child’s favorite toys, keepsakes or craft supplies. Bonus points to the mesh pockets that expand to fit your child’s drinks or toys and shrink back to ensure that everything stays put. If you’re looking for an organizer that is versatile, this might be right up your alley. It is easy to unclip it from the back of your vehicle seat and clip it onto your stroller for on-the-go handlebar stroller organization that can’t be beat. Priced mid-range in comparison to other options on our list, this organizer offers plenty of value for a small investment. If you know you need an organizer with space and pockets galore, this is the one for you. This backseat organizer features 12 different types and sizes of compartments, perfect for holding all sorts of items. 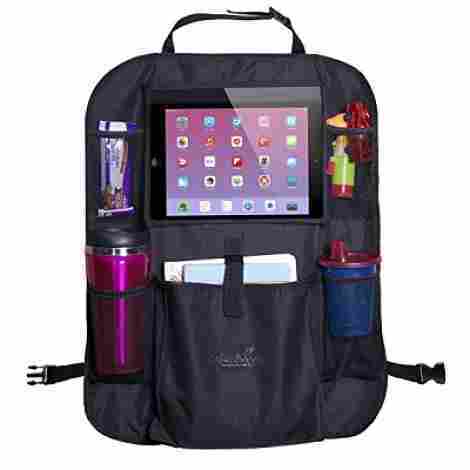 It has two mesh drink holders, a hidden pocket to hold your tablet and a convenient removable pocket for moms and dads on the go. Thanks to the design of this storage organizer, it won’t fold in or down when it’s filled with your toys, drinks or knick knacks. 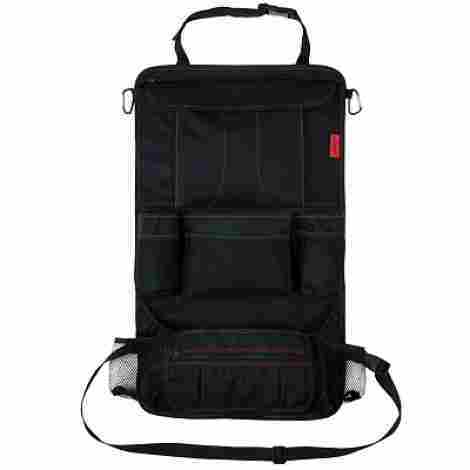 It’s made with heavy duty and waterproof 600D polyester fabric for an extra durable feel. Not only does this product serve as an organizer for your passengers, but it also will protect your vehicles seats from reckless little ones. As previously mentioned, the fabric this organizer is made of is waterproof material that will stand up well against wet and muddy shoes. Priced on the higher end of the spectrum in comparison to other items on our top ten list, this organizer is worth the investment. If you have destructive little ones you will benefit from the durability of this product. If you’re in the market for a long-lasting organizer that will provide years of backseat cleanliness and organization, look no further than this product. Built for longevity, this back seat organizer doubles as a kicking mat, perfect for little ones who love to kick the back of the seats, while also providing you with a place to store all of your kids favorite items. These organizers are extra large and are made to cover the entire seat back. They are 24” x 18” in size and, as such, will provide extra coverage from dirt and mud. A definite plus for parents of kids who love to get dirty! Unlike other backseat organizers with inflexible elastic straps, this storage option is made to fit into any vehicle. They arrive with very long straps that adjust to fit on the headrest of your car seat as well as along the bottom between the back of the seat and the base of it. This style ensures a perfect and secure fit every time. This product comes in a two pack so, while the price is mid-ranged in comparison to other organizers on our top ten list, you’re receiving product for your money. This makes it definitely worth the small investment for double the protection and storage space. This organizer features a number of different sized pockets to ensure that there is a place for everything. Mesh pockets with elastic lining create handy pockets that will expand to hold toys or drink bottles no problem. In addition to the organizer that attaches to the back of the seat, this product also comes with bonus storage for the other passenger in the front seat. This organizer simply slides over the sun visor and can hold all pertinent travel documents and other daily essentials within close reach. You always have to appreciate when a company stands by their product so much that they offer a lifetime replacement guarantee. This manufacturer is no different and if you have any issues with your product, they will replace it for you. 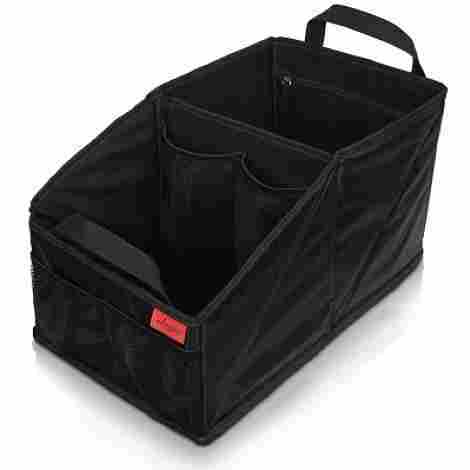 Similarly priced to other options on our top ten list, what sets this organizer apart is its many storage pockets and bonus visor organizer. If you find yourself wishing you, as a driver or front seat passenger, had a storage unit to access like the children in your backseat, this option may be right up your alley. This backseat organizer is a little different than other options on our top ten list. It is not only a handy storage unit, but it also acts as a lap tray for little artists in the back seat. The height of this organizer can be raised or lowered to ensure that your little Picasso is able to access the lap tray. You can also adjust the seat angle of the seat that it is attached to to ensure that your child is able to reach the tray. Another great feature that sets this organizer apart from other options is that it is very easy to grab and go to take it with you wherever you may go. It acts a handy carrying case for your little one’s art supplies or toys. Priced higher in comparison to other organizers on our list, this is worth the investment if you have a little one who loves to stay active on long car rides with coloring books or other art supplies. This organizer features a number of different pockets, two mesh bottle holders, a slot for your headphones and a compartment to store baby wipes or tissues. It also doubles as a stroller storage unit. Turn your vehicle into an entertainment center for your little one. This organizer features a pocket in the top that will fit tablets up to 11.5” in size. The plastic that protects the tablet pouch is touch screen sensitive so you can still operate it from inside the safety of the pocket. This organizer has a handy insulated compartment made to keep baby wipes wet, tissues contained and provide readily available access. Priced middle of the line in comparison to other options on our top ten list, this organizer is perfect for the parent who values access above anything else. It features pockets that make everything accessible for little hands. Because it is easy to detach and attach to a stroller for on the go organization also makes it a handy option for parents of little ones. Our final product on our top ten list is this unique organizer that can double as a dining table for your backseat passengers. Made with premium PU leather, this organizer makes your backseat look a little bit classier than other options available on the market today. This organizer has a pocket for your tablet, two cup holders, an umbrella pouch, hanging hooks, a pocket for coloring or craft paper and two larger sized pockets for whatever else you can think of. This organizer features a tray that folds down. 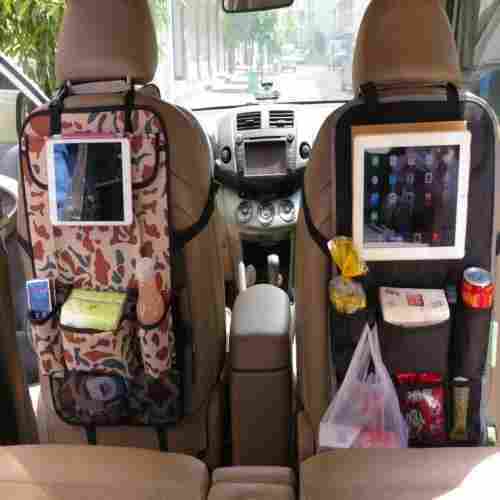 Unlike other back seat organizers with similar trays, this one is made of a harder material making in sturdy and able to hold up to two kilograms worth of items. By far the priciest option on our top ten list, this organizer is a great investment for the parent who wants to have a tidy-looking back seat while maintaining a stylish appearance. The high quality leather material that this organizer is made of will surely keep your backseat looking sophisticated and clean. How much storage space is available, and what can fit? When traveling with a baby, whether it be short distance or long distance, it’s always a good idea to be as organized as possible. It can be really difficult keeping your car from being a disaster when you have little ones, but it’s extremely helpful. With all of the different things we tend to keep with us in the car for baby, it’s a great idea for parents to invest in a backseat organizer for their vehicle. Having everything you need right there in one tidy space can make a world of difference and can really help to lower your stress level. Once you have your backseat organizer, you might be trying to figure out the best choices of what to keep in it. There are tons of different things that are helpful to put in your backseat organizer. What you choose to keep there will depend on your and your child’s specific needs. So, obviously, one of the most useful things to keep around with little ones is toys! Keep a couple of toys in your backseat organizer for easy access during car trips. You’ll need to choose smaller toys that will fit well in the organizer and be easy for your child to play with while they are in their car seat. It’s also a clever idea to have specific toys that are just for the car. This will give your child something to look forward to about going into their car seat. Take it a step further and have multiple car-only toys that you rotate in and out of the backseat organizer. For example, you may keep a few blocks in the car for your child for about a week and then put the blocks away for later use and replace them with a small stuffed animal or perhaps a board book that you keep in the car for a week or so before rotating them out again. Food is another staple item to always have around when you’re a parent. If your little one has begun solids already, you’ll likely want to have some on hand in case they’re ready to munch down on the road. They also provide a nice distraction for your child to help everyone make it through the trip. The best choices when bringing food into the car, especially for baby, are finger foods that are not particularly messy. Ideas include puffs, crackers, dry cereal, pretzels, and dried fruit. You’ll also probably want to bring along a drink for your little one. All of that snackin’ can really make your baby thirsty. 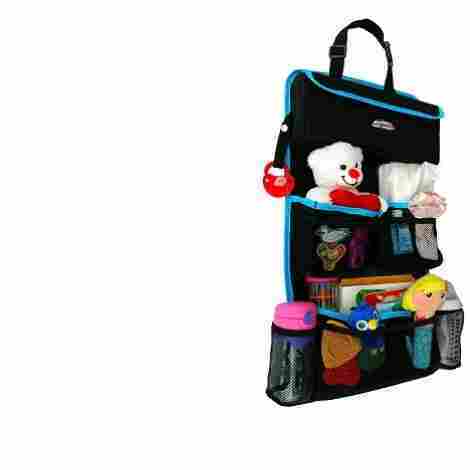 The backseat organizer is a wonderful place to put your baby’s bottle or sippy cup. It keeps it nice and close in your reach, and you will always know exactly where it is when you need it. When going places with your baby, you’ll probably have everything to take care of all of your diapering needs in your actual diaper bag. However, it’s also a great idea to keep a few basic things in the car at all times. Putting a diaper or two in your backseat organizer can be a lifesaver in emergencies, and you know it will always be there if you run out of diapers or forget your bag. 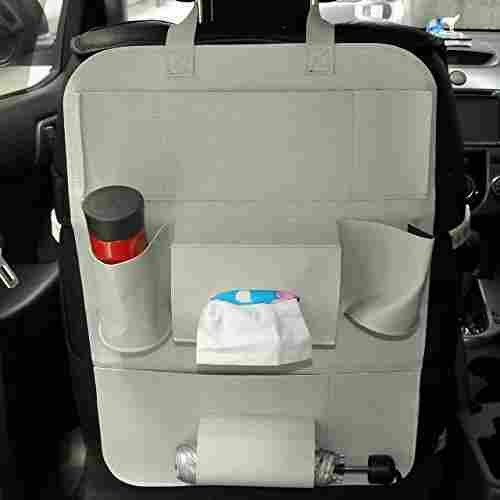 Wipes are also an essential item in your backseat organizer. They aren’t only good for emergency diaper changes, but also are super helpful in plenty of other situations as well. They’re great to have for cleaning up little hands and faces after a snack, and they can also help clean up any spills that are likely to occur when driving babies around. 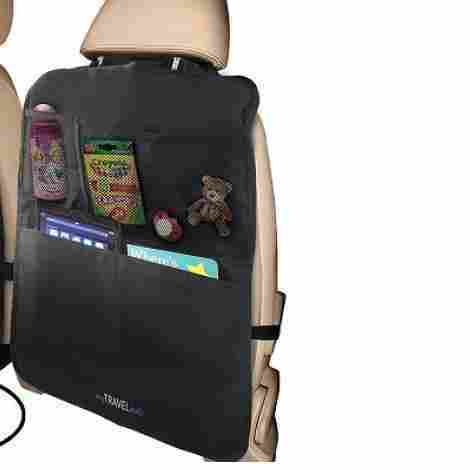 One thing that many parents choose to include in their backseat organizer is electronics. They can be extremely useful when taking a car ride with a baby, especially if it happens to be a long car ride. Tablets are a particularly popular choice. You can play a movie for your baby, or if they’re old enough, they may even be able to play a game on the tablet or another device. This entertains and distracts baby throughout the car ride which can make a world of difference in everyone’s car experience. A less often thought of, but still an excellent choice of what to keep in your backseat organizer as a parent is some basic first-aid supplies. You shouldn’t need anything real fancy, just a few basic things should do the trick. You should definitely include a few different sizes of band-aids as well as something like triple antibiotic ointment. It wouldn’t be a bad idea to include some alcohol swabs in your backseat organizer’s first-aid kit too. The size and what you include in your first-aid kit should be based on your own preferences and how prepared you want to be. You may want to include a few basic infant medicines should you need them. Things like Tylenol and Benadryl are always good to have on hand just in case. As parents, we all know how surprisingly quickly our babies go through clothing. Keeping a change of clothes in your backseat organizer will help you have peace of mind that when those inevitable spills and blowout diapers happen that you have something else to dress your baby in. The little plastic bags that you get from the grocery store make wonderful trash bags. They’re easily disposable, and the perfect size for throwing out the trash in the car. Not to mention that they are free and abundant. Keeping a few of these in your backseat organizer will make keeping your car clean, even with a baby, much simpler and more convenient. They also serve as a great place to put your dirty diapers until you’re able to properly dispose of them. No matter what you end up choosing to go into your backseat organizer, it’s guaranteed to be super helpful. You no longer have to worry about dealing with toys rolling all around your floor, you have everything you need in arms reach, and you can even be better prepared for accidents or minor emergencies. Parenting can be hard and there is no doubt that traveling with a baby is no easy feat. You have to be prepared, patient, and flexible. Try to remember that it isn’t just hard on you, but travel can be hard on your little one too. Luckily, there are tons of things available now that can make travel easier for both you and your baby. Here is a list of 5 things you must have to make travel with a baby go as smoothly as possible. Frequent diaper changes are an inevitable part of parenting that is necessary for your baby’s comfort and health. Changing diapers during travel can be extremely inconvenient. Having a good portable changing can minimize that inconvenience and make diaper changes quick and easy. 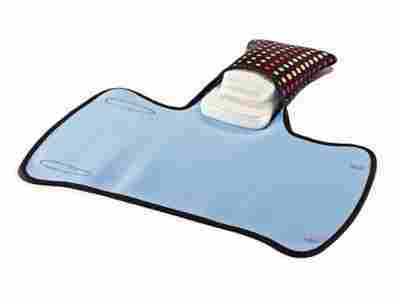 When searching for a good portable changing mat, there are several things you want to look for. The best portable changing mats are more than just a changing mat; they include other features as well. One of the main things you want in a portable changing mat is a place to store your diaper changing supplies such as diapers, wipes, and diaper rash cream. Having a place to store these diaper changing essentials with your changing mat gives you the benefit of having everything you will need for diaper changes right in one convenient spot. Something else to keep in mind with a portable storage mat is how much room it takes up. Ideally, you would want something that folds up well allowing you to easily store it in the car and put it in your baby’s diaper bag when necessary. You also want something that easily wipes clean. Being machine washable is also another great benefit to look for when shopping for your portable changing mat. Babies love to snack. It’s likely that baby will become hungry during travel, so you obviously want something quick and easy to have on hand for your baby to munch on whenever hunger strikes. There are lots of different ways you can store snacks for easy access in the car. You may prefer to try reusable snack bags for your baby’s snacks. These can be a great option that is convenient as well as environmentally friendly. Not to mention all of the adorable colors and designs that they come in. You will likely need to open this yourself and offer your baby a little at a time rather than handing over the whole bag. If you want your baby to be able to easily access their own snacks in the container, but don’t want to give them an open container that they are likely to just dump out, you may want to consider an option for a portable snack container with a slotted lid that is made of soft silicone. These nifty cups prevent things from spilling out of them but still allow little hands to reach in and grab what they want. When traveling with a baby, you must stop frequently. This is not only because babies require frequent diaper changes but they also need regular breaks from their car seat. Something else that can make traveling with a baby inconvenient is lugging the baby from place to place when you’re in and out of the car so often. A baby carrier can make carrying the baby much easier and more convenient. Wearing your baby in a baby carrier is much better for you as they are ergonomically designed to distribute baby’s weight evenly over your body instead of causing you to strain with one arm and hip. There are tons of different types of baby carriers available so choose carefully which carrier is best for you and your family. On top of being convenient and making carrying your baby easier, wearing your baby has all sorts of other benefits as well. Some of the many benefits of babywearing include having your hands free for other tasks, helping to increase the bond you have with your baby, and helping your baby to feel safe and secure. Studies have also shown that babies that are worn tend to cry less and learn faster since they are constantly seeing the world from an adult perspective. Obviously, when you’re traveling, you’ll have to eat and so will baby! You’ll likely be stopping at a few restaurants if you’re going far at all. Most restaurants have their own high chairs in-house, but they come with some considerable drawbacks. For one thing, they often are not well maintained. The straps may not work right and there could be a lot of wear and tear on them. Additionally, they may not be cleaned in-between uses. This means that you’re likely to get a high chair that is gross and sticky with the previous occupant’s food mess all over it. With a portable high chair, you don’t have to worry about any of those things. 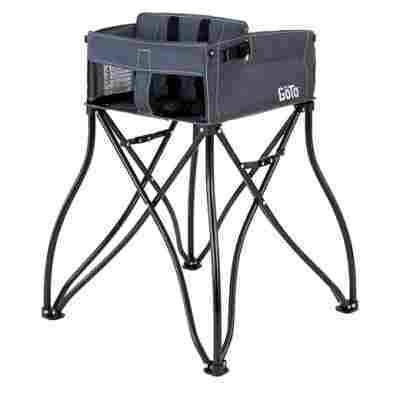 There are a couple of different types of portable high chairs available. One of the most convenient high chairs for travel use is a high chair that actually hooks directly onto the table. These chairs are easy to operate and allow baby to very easily reach the table and eat on the same level and surface as you. Babies rear-face in their vehicle seats. This can be slightly inconvenient since you can’t see your baby from the front of the vehicle. Even though it’s a little inconvenient, it’s completely vital as studies show that babies that are rear-facing are approximately 500 times as safe as those who are not rear-facing. A mirror to put in front of your baby’s seat that allows you to see them from the driver’s seat can be extremely helpful and provide you with much-needed peace of mind. By being able to see your baby you know that they are okay. 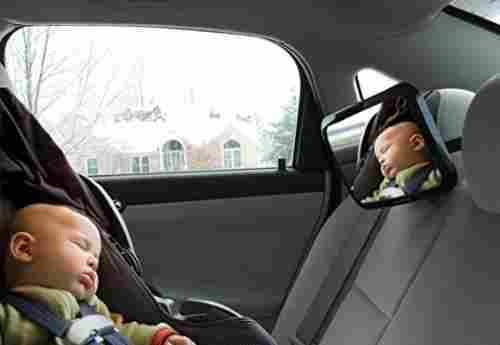 When choosing a mirror for your baby’s back seat there are some things to think about. You should probably choose something that has softly rounded corners to help prevent any possible injuries should your baby somehow be able to get to the mirror. It’s always better to be safe than sorry. 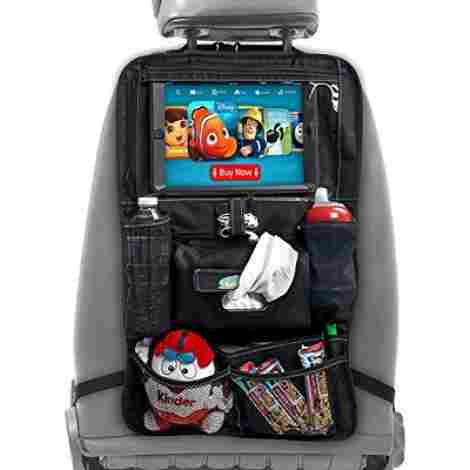 Material is an important aspect to consider when choosing a backseat organizer. Though many of the options on our top ten list are made from the same type of material, we still took it into consideration when compiling our list. 600D polyester was the most common material type used in the production of these items. As previously mentioned, this is a great material choice in this type of product because it’s water-resistant and highly resistant to harmful UV radiation that can prematurely destroy other types of material. Another popular material option is PU leather – a synthetic form of leather that is waterproof and resistant to cracks and wear and tear that the sun can cause on other types of material. One of the main criteria we were on the lookout for when researching for this article was what the storage capacity of each of the products was. This is because the main reason anyone wants a backseat organizer is to store all of the toys, books, water bottles and snacks that can easily find a home on the floor or car seat without a proper organization system in place. In order to ensure we were reviewing products with the most accessible and functional features, we made sure to pay close attention to the size of and type of storage pockets each of the organizers offer consumers. In our top ten list you will find storage units with zippered pockets, elastic mesh pockets, bottle holders, tissue holders and even tablet storage pockets. Each of these different designs offer the user different perks. Mesh pockets are great for being able to see what you’re storing and where. These types of pockets also usually feature an elastic band around the top to expand and shrink around your items, ensuring a snug fit for whatever you’re putting in there. Zippered pockets are ideal for storing small items, like crayons or small toys, that can easily get lost if they’re not contained. Bottle holders are convenient for your passengers to be able to store their beverages in a place that is easily accessible to them. Tissue and wipes holders are perfect for parents of little ones for when there’s a spillage in the vehicle or a runny nose needing a quick clean up. Tablet storage pockets are the newest addition to backseat organizers and are perfect for entertaining little ones on long car rides or road trips. It’s important to make sure you read the product description to ensure your electronic device will fit snugly inside the tablet pocket to avoid disappointment. Gone are the days where we had to purchase items without fully knowing what to expect. With the invention of shopping websites like Amazon, we, as consumers, can make informed decisions about the products we choose to invest in. When compiling our top ten list, we looked at reviews from hundreds of different Amazon customers to make sure we were indeed offering the top ten best products available on the market today. These products we have settled on have consistently received great reviews. If you choose to purchase one of the options on our list, we are confident you will be adding your own positive Amazon review in the very near future. In addition to different types of storage compartments, there are also different styles of backseat organizers available in our top ten list. There are the typical backseat organizers that most people think of when they hear those words. These are the styles that attach to the back of the seat. They are convenient option for little ones who want to have their items within reach without completely overtaking their space. Many of these styles also offer a convenient “kick mat” for little ones who like to kick at the back of the seats in the car. These kick mats are easy to clean and offer your child a place to kick without destroying your vehicles upholstery. There are also styles available that fit between your vehicle seats and are accessible to your passengers on either their left or right side, depending on where they are situated in the car. These are a great option for kids who are a bit older and are free to twist and turn in their seats more easily. The third option available on our top ten list is the kind of organizer that turns into a lap tray. These are a perfect option for families with children who love to color or write when they’re traveling. This style typically features a number of different storage components as well as a fold down lap tray for easy crafting and coloring. Gone are the days of ugly backseat organizers that fold up at the sides when you try to store anything in them. These options on our top ten list are among the most attractive looking on the market. Whether you’re looking for something to just store all of your items or looking for a way to spruce up the look of back seat of your car, there is something on this top ten list that will for sure suit your needs. Q: How will I know if the organizers will fit in my vehicle? When you’re researching organizers on Amazon, be sure to check the product information provided by the manufacturers. They will usually go into full detail about the size of the organizers as well as how they attach in the vehicle (via clips, straps, etc). Also if you’re still unsure after reading the product information, many of the manufacturers are available to answer your questions right on Amazon in the Customer Question & Answers section. If the company is not active on Amazon, there are plenty of customers who also read the question and answer section that can provide some insight for you. It is important to take into account the style of attachment for the backseat organizers you are considering. Some need to be attached to the headrest in your vehicle and if you don’t have adjustable headrests or if they’re the wrong size, you may not be able to use that particular style in your vehicle. That’s okay, though, because there are plenty of different attachment styles available on the market and on our top ten list, too. Q: What is the best material to look for? Many of the backseat organizers on our list are made from the same type of material – 600D polyester. This fabric is both durable and easy to clean, making it a great option for a product that will be mostly used by children. Polyester is able to absorb some water so it is a great material to be on the lookout for if your kids are typically wading around in water puddles and then kicking at your car seats afterwards. This material is also a great choice for something that will be stored in your vehicle as it is highly resistant to UV radiation. This just means that it can be exposed to the sun rays for longer periods of time without breaking down. One of the options on our top ten list is made with PU – polyurethane – leather. This is a synthetic version of leather and offers many advantages. It’s waterproof, lighter than real leather and won’t crack or fade when exposed to direct sunlight. Q: Why do I need a backseat organizer? There are many possible answers to this question but we personally believe that everyone can benefit from having a storage unit like this in their vehicle. We think it’s especially important to have an organization system in place in the vehicle if you have children. It’s very easy for kids to become little tornados of toys, stuffed animals and craft supplies and if you don’t stay on top of these kids of messes, it won’t take long for them to overtake your vehicle. Not only will having an organizer help keep your vehicle looking tidier and less like a natural disaster zone, they’ll also help teach your children about the importance of being tidy and having a place for everything. Some children may even like having an organizer in front of them in the vehicle as it makes them feel like they have their own personal space in the car. Q: What should I put in my organizer? In short – anything and everything that will fit in there. Books, snacks that won’t go back in the car, coloring books, pencil cases, tissues, stuffed animals, tablets, water bottles, etc. What you put in your backseat organizer is entirely up to you and your little passengers in the backseat. It’s not a bad idea to get the little ones who will be using the organizer to help decide what will and won’t go in there. They will love having the responsibility of choosing what to bring along for the car rides and you’ll love that they love keeping things together and tidy. Q: Can I take my backseat organizer with me? Some of the organizers on our top ten list are made to be taken in and out of the car easily. Some are easily attachable to strollers and some even act as a little carrying case. If portability is an important aspect for you when it comes to choosing a backseat organizer, make sure you invest in one by a manufacturer that prides themselves on the portability of their product. Q: How do I install my backseat organizer? Every backseat organizer is installed different. Some attach to the headrest of the passenger seats. Some of them have buckles and loops that go around the entire vehicle seat. If you have a vehicle that is unique in design, you might want to make sure you read the product description thoroughly or check out the Amazon Customer Questions & Answers section on the product before placing your order. 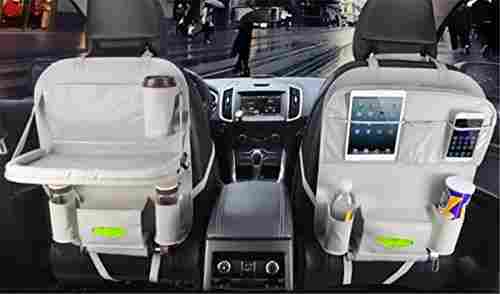 This is just to ensure that you know going into your purchase just how your new backseat organizer will need to be installed and that you have the proper requirements in order to do so. When it comes time to make the decision about which type of backseat organizer is best you must think about your children and your family’s particular needs. Are you a techie family that travels with tablets and other electronics? It may be worthwhile to think about purchasing an organizer with a slot for your tablet such as the Cartik or Mom’s Besty options on our top ten list. Do you have a little artist on your hands who loves to craft and color while traveling? You may want to consider an organizer that also doubles as a lap tray such as the Ideashop or My Specialty Kids Shop options above. When it comes down to it, you can’t go wrong with any of the options available on this page. We firmly stand behind these products and believe you will find something that will suit your particular needs on our list. Happy travels! Materia.nl – Polyurethane Leather: Is Synthetic Better?